This energy-efficient flushmount offers the lively Diamonds pattern that can jazz up the look of a room. This stylish, energy-efficient flushmount fixture features a custom made giclee style shade with a stylish Diamonds pattern printed on high-quality material. An acrylic diffuser at the bottom prevents glare from the two included CFL bulbs. The canopy and accents are in a bronze finish. Shade printing process U.S. Patent # 7,347,593. Can a lower wattage CFL be used in this fixture? BEST ANSWER: Hi - Yes, you may use lower wattage GU24 CFL bulbs if you wish. What is base type of the CFL's and the color temp? BEST ANSWER: Hi - This uses a GU24 base bulb and has a 2700K color temperature. What color is in the shade? Is it gray? BEST ANSWER: Hi Jaime - It's technically a black diamond pattern against a white background, but from a certain distance the effect can look gray. I really wanted to love this fixture. I was hesitant to purchase because the fixture only takes GU24 base CF light bulbs which causes some limitations however the included light bulbs state they are 2700k which is a warm white color which is the most "yellow" on the spectrum which is what I wanted. However, that is not the case here. Once the light bulbs get to full brightness, they are stark and sterile and my hallway looks like a hospital operating room. The color temp resembles 4100k cool white which can appear blue on the spectrum. We tried lowering the wattage to 60 watts hoping the 100 watts was causing the super bright look. Unfortunately, it still looked cool white. In addition to the fixture cost, I had the 2 fixtures professionally installed in my hallway so I am pretty much stuck with them glaring at me. Side note, the pattern appears gray not black. 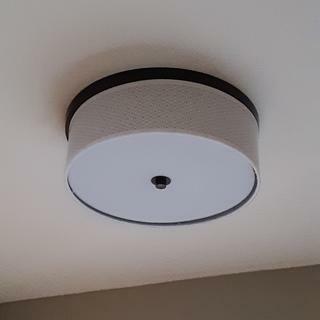 It is a nice printed pattern and the fixture appears to be made well, so if you need a super bright WHITE light operating fixture, this is perfect. 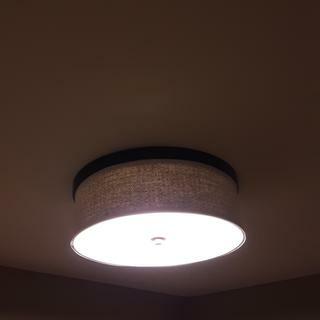 Hi Yvonne W., sorry to hear that your fixture is not producing the light output that you expected. Could you please provide more details on the bulbs you're using to our customer service team? They can assist with other bulb recommendations that may help to give off a more warm white color temperature. They can be reached via phone, email, or chat. Thank you. Add delightfuldecorative charm to a transitional space with this rubbed sienna and aged silver semi-flush ceiling light.